MARK Lloyd scooped the Gosport & Fareham Snooker League’s Scratch Singles Championship for a second successive year. The 18-year-old from Gosport retained his title by beating ex-professional Danny Auld 5-1 in the final at Stoke Snooker Club. Lloyd, who also beat Auld in last year’s final, said: ‘I was fortunate that Danny wasn’t playing as I know he can and was missing the chances to win the frame in one visit. ‘I just had to capitalise and get over the winning line. Lloyd is a former national champion at under-16 and under-18 level. Meanwhile, in the final of the 2016 English Under-14 Championship, Jamie Wilson was well beaten 5-0 by Ryan Davies, who hails from Oldham. The pair met again this week in the last-16 of the English Under-18 Championship at the Northern Snooker Centre, Leeds. Wilson was defeated 4-2 but he battled well and produced some excellent safety play to give Davies, who is now in the final, a match to remember. n Third-placed Zak Truscott lost to Owen Jenkins in his opening game of the Wednesday Junior Snooker League Waterlooville Sports Bar. But the 14-year-old responded by overcoming the top two, Samuel Laxton and Dean Russell, to win the first group. Russell closed the gap on Laxton to one point. Henry Martin heads division two from Lennox Anderson. Harry Wilson had the best possible start in his defence of his six-point lead over Truscott at the top of the Monday Junior Snooker League. The 12-year-old beat the defending champion in his first match and then knocked in breaks of 30 and 22 against Anderson. But he lost black-ball games to Martin and Jenkins which allowed Truscott to win the group and cut the gap to four points. 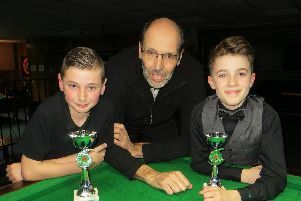 Daniel Cridland, 10, edged eight-year-old Amelia Ford in what can only be described as an epic frame on their debuts in the Junior Pool League. Jamie Wilson won the round-robin group for the second week running and produced the league’s first eight-ball clearance in his final match against brother Harry.